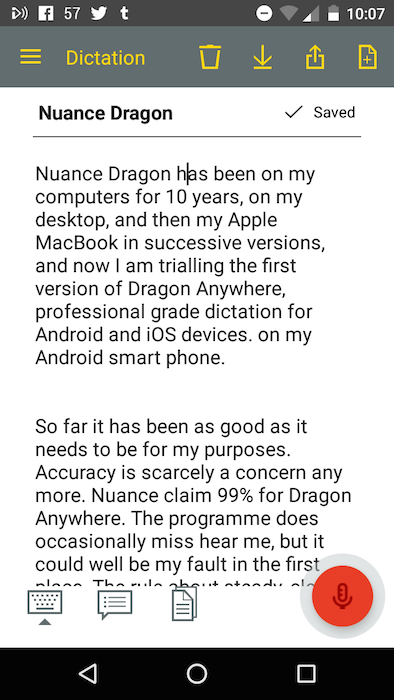 Nuance Dragon has been on my computers for 10 years, on my desktop, and then my Apple MacBook in successive versions. Now I am trialling the first version of Dragon Anywhere, “professional grade dictation for Android and iOS devices”, on my Android smart phone. So far it has been as good as it needs to be for my purposes. Accuracy is scarcely a concern any more. 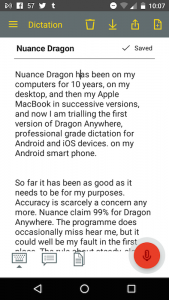 Nuance claim 99% for Dragon Anywhere. The programme does occasionally miss-hear me, but that could well be my fault in the first place. The rule about steady, clear enunciation still holds good with dictation software. The point is, I am now able to convert thoughts and words into text, without typing, wherever I happen to be (provided I have 4G or Wi-Fi), on the one device I am always likely to have with me. My smartphone, incidentally, has a usefulness beyond anything I could have imagined even a few years ago. A device that costs only £160 is equipped with every aid I need for my job. Dragon Anywhere surges effortlessly past the standard dictation aids that come with iPhones and the MacBook. Apple’s Pages’ Dictation function, which also needs a Wi-Fi connection, switches off after about 30 seconds of use. It is irritating to have to keep turning it on when you are dictating at any length. and comes with an impressive list of commands and instructions. It is a premium product, aimed at “field workers, lawyers, social workers, public safety officers and other professionals”. You subscribe to the cloud-based programme (£144 a year) – rather than owning it outright. We are coming close, perhaps not many years away, to a time when we will be controlling many of the everyday, inanimate things in our lives by our voices. Nuance, and programmes like it, will be the foundation of this new age of voice command. In the interests of full disclosure, I must say that Nuance have kindly given me various iterations of the programme to try and report on, including this one, but I am setting out my own views here. I have pointed to various shortcomings, as I saw them, in the past. For example I grumbled about an earlier version for the Mac. When I corrected errors, the corrected word would invariably start with a capital letter, even in mid sentence. On the other hand new sentences would invariably start with a lower-case word. In both instances, I would have to make the additional correction by hand. And sometimes the cursor would go charging back through the text as if on a hunt for an earlier version of some word. In a long article that could take quite a few seconds, and I was powerless to stop it. The version I am using now seems free of those glitches. I don’t think I’m overstating the capabilities of this software. I’ve moved through so much technology in the course of my career, starting with standard typewriters. Then you tried to be as accurate as possible. Mistakes were almost impossible to correct by overwriting. You made an untidy line of XXXs, or did a manual correction in pen afterwards. On through the early, clunky desktops, and then laptops, which sometimes seemed to have a mind of their own, randomly writing words and sometimes entire lines at some other place in the piece you were composing. None of this has prevented generations of writers turning out a huge body of literature, where the limiting factors were inspiration, energy and ability, rather than the physical constraints (slow typing speed on a useless typewriter, for instance) to getting things down on paper. Who would want the old ways back, though, now we know we can accomplish the physical process of writing so much more easily and quickly? Being able to compose blogs and articles so easily is important for another reason.On the one hand it speeds up the delivery of the immense amount of dross written every day, and available online, much of it in the “below the fold” comments to newspaper articles. However, this speed is such a bonus for freelance writers who are making a living from their work in a hostile and ungrateful electronic world, where the Internet offers paltry rewards for our work, and generally nothing at all. The writer needs to spend as little time as possible committing his or her thoughts to the electronic version of “print”.